You sometimes simple is the best. For the Create with Connie and Mary Thursday Challenge we have a fun color challenge and I decided to go with the ‘simple is best’ idea for this. The colors are Calypso Coral, Daffodil Delight and Bermuda Bay. As I was playing around with it first I got my ‘pre-order’ stuff with the fun little flower punch in there and then after playing around I just wanted to showcase these pretty colors just on white! Whisper White 5 1/4 x 4 run through Chevron Embossing folder and add to card front. Punch Petite Petals in Calypso Coral, Daffodil Delight, and Bermuda Bay. Punch the Flower from the NEW Itty Bitty Accessories Punch Pack from Whisper White. Layer the flowers and add a matching Candy Dot to the center. Then add flowers to card front to finish off. This entry was posted in Clean and Simple (CAS), Create with Connie and Mary and tagged Something to Say. Bookmark the permalink. Such a super sweet card! Love the simplicity of it! Those bright colors just pop off the white background! Love it! These colours just pop off the white background Mary – I love the subtle layering and the embossed chevrons – this is a great card! Mary, your card is so adorable! The trio of flowers in these colors is so sweet and unassuming yet it packs such a punch!! The new little flower punch is perfect for the centers also! Love it! 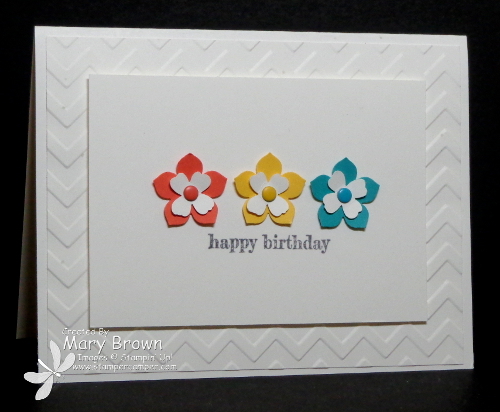 Love the simplicity of your card – you even lined up the colors to match the color sketch! Just darling! Fabulous idea for the color challenge! I love the clean and simple look of the three flowers!